This weekend was a whirlwind! On Friday night, the four of us went to the local high school football game to see our team come from behind to win in overtime. The team is now 8-0! What a night! Saturday, I woke up early to meet my mom and sisters at a local festival. The weather was beautiful for the outdoor event. We enjoyed the food (including fried oreos...yum! ), crafts and antiques. I found the coolest booth - Just Your Type - with vintage typewriter jewelry. I had a bracelet custom made with the year we were married, all of our initials and the boys' #18. 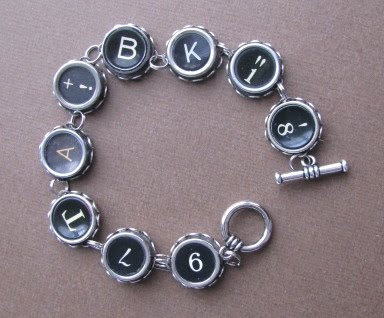 Love that my bracelet is an original piece of art made from typewriter keys from the '20s and '30s. I already have a "W" ring on order from them and I'm debating another purchase. I had to leave the festival a little early to rush home. My friend Debbie had called earlier that morning to see if I had plans for the evening. 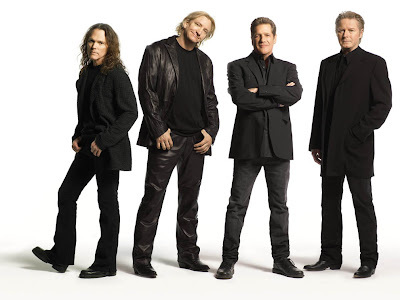 Her son was sick, so I was able to use her husband's ticket to go see the Eagles with her! The concert was the first one in the brand new Yum! Center in Louisville. It was a great night with a great friend, great food and great music! 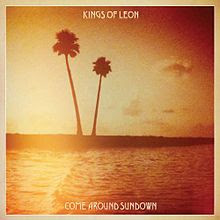 I am the proud owner of Kings of Leon's album #5 - Come Around Sundown. Okay, I've never had fried oreos! Don't know if we even have them in OR! lol! Love the bracelet, it's so cute! I bet the Eagles were awesome! And I saw the new KofL release on my itunes email! Let me know how you like it!